This week we looked at some glorious artefacts from Bronze Age Denmark, and at the introduction of iron smelting to Europe north of the Alps. Both in Denmark during the Bronze Age, and during the 'Urnfield Culture' of mainland Europe, decorative metalwork reached great heights of artistic achievement. 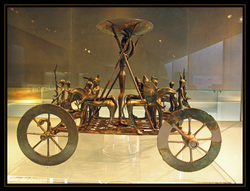 Many of the objects that have survived are thought to have been intended to be used in rituals. Take a closer look at the Strettweg Wagon (illustrated left) and decide for yourself. This article discusses the Strettweg Wagon in some detail. Written by a Japanese academic, it has some odd linguistic quirks but the meaning's easy to discern. See the slides below for other highlights of the time such as the Danish Sun Chariot, the Vekso Helmets and the amazing 'Golden Hats' of which four examples are known.